Timothy Mathues, Veteran Outreach Program Coordinator at the County Office of Military and Veteran Affairs, said this Lunch and Learn is particularly important to our veteran employees as it will provide valuable resources for the veterans and their families. The session will include a discussion with panelists who represent several nonprofits and will have a question-and-answer period. Sign up for the lunch and learn session now. Employees requiring an accommodation should email DHRWellness.FGG@sdcounty.ca.gov. If you are unable to attend the lunch and learn, there are still resources available to you. 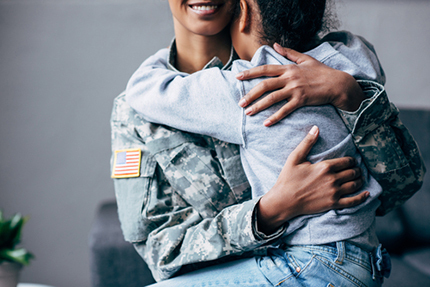 The County Office of Military and Veterans Affairs provides benefit information and assistance, plus other support to San Diego County veterans and their families. The County also offers Courage to Call, a service that lets veterans talk directly with a fellow vet who knows what it means to serve and can connect the caller with help. You can call 2-1-1 or visit the website to use an online chat. In addition, VALOR, an employee resource group, is open to veterans, military families and patriotic supporters.